Finally got the tiny tractors in out of the weather. The diesel Kubota took hours and some warming and recharging to get started (I should’ve put ’em in sooner, but I wasn’t believing in the COLD). You can just make out the John Deere riding mower, parked sideways and in for the winter. The Kubota I fire up every few days to keep it limber, and it goes on snow clearing outings, mainly to make paths to the greenhouse. Unheated and uninsulated, the Drive Shed is still the place to be for machines in the cold! This version was built in the 1940s (here’s a view from the other side, it’s sticking in on the left), and like most things on the farm, has quite the history of…use All manner of vehicles, probably in the hundreds, have been stored or repaired here: tractors, cars and trucks, dirt bikes, snowmobiles, buggies and sleighs (that’s a 1977 Ford F-150 pick-up on the right, slowly being repaired by Bob’s son, Robert). The upper level is quite huge. It’s now mainly crammed with parts and pieces—assorted useful “junk”—but back in the day, a pulley system raised and lowered a wooden platform (it’s a manual, open elevator), and as the seasons changed, the farm’s various horse-drawn carts and buggies would be swapped up and down with sleds and sleighs for different purposes. Now, they’re long gone—one sleigh and no horses remain—but maybe they’ll be back! Looks like a pretty cold climate. 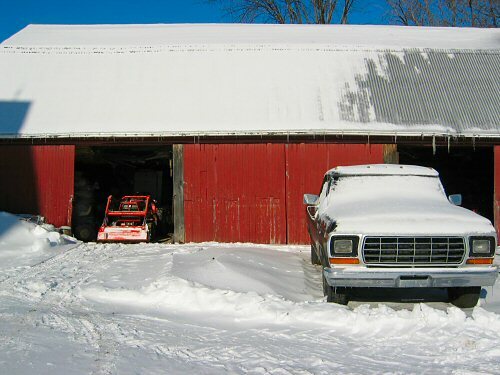 Is it fun removing the snow with the tractors that get stored in the garage shed? That is a very large shed. I like how you can store your tractor in it. How do you like doing snow removal with your tractor. That seems like fun. Does it have a hard time starting after being in the shed during the cold for a while?